SUGAR - COPPER BLUE EXPANDED EDIT. (2CD+DVD DIGI) | Online Shop | Wizard LTD. Album: "COPPER BLUE EXPANDED EDIT. 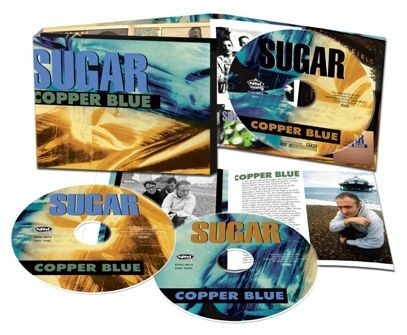 (2CD+DVD DIGI)"
• Copper Blue is the classic 1992 debut album by Sugar. Frontman Bob Mould had sung and played guitar for seminal midwest punks Hьsker Dь, openly acknowledged by the likes of Nirvana and The Pixies as a huge influence. Following their break-up and two well-received solo albums, Sugar saw Bob return to a band set-up, signing to the iconic Creation label and scoring indie chart hits with “A Good Idea”, “Changes”, “Helpless” and “If I Can’t Change Your Mind”. Copper Blue’s ebullient collection of richly melodic and anthemic songs saw Bob triumphantly reclaim an alternative rock legacy he had helped create. The album went in at number 10 in the UK album charts and was NME’s Album Of The Year. • This deluxe expanded edition includes all the non-album b-sides, a BBC radio session and a full length 1992 live concert. The concert, a favourite of Bob Mould’s, was recorded by Chicago college radio station WXRT and has been much bootlegged. This is the first legitimate release, with pristine sound quality, and features the only recorded versions of Sugar covering “Armenia City In The Sky” by The Who and “Dum Dum Boys” by Iggy Pop. • The DVD features all the promo videos from Copper Blue alongside TV appearances from the BBC and MTV archives. • The 32 page booklet contains rare photos, memorabilia, and exclusive new interviews that tell the story behind the album in the band’s own words.